Are you taking steps to boost your Tumblr presence? Would you like to learn the best way to increase engagement for your brand on Tumblr? Tumblr is the fastest growing social network; Tumblr is growing faster than Pinterest and Instagram. If you are serious about improving your visual social media presence, you cannot ignore Tumblr, a social network dominated by images. Images make up 78.11% of all posts. The best way to improve your Tumblr presence is by creating a strategy that focuses on getting more notes. A note on Tumblr is a ‘Like’ or a reblog. The Tumblr ‘Like’ is similar to a ‘Like’ on Pinterest and the reblog is similar to a repin on Pinterest or a share on Facebook. Taking steps to get more notes will increase engagement on Tumblr, helping you gain more followers, attract new audiences, and drive traffic back to your website. Here are four things you can do to get more notes on Tumblr and maximize engagement. 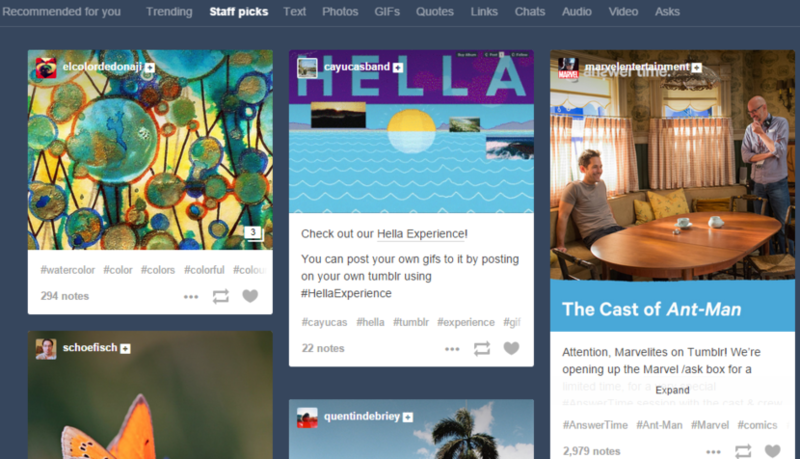 If you want to boost your Tumblr presence, start by studying the Tumblr explore page. Find the Explore page by clicking on the round icon on the top right corner of your Tumblr home page. First, check out the posts section. 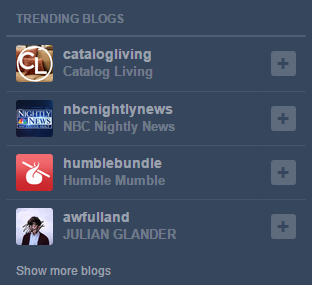 Here you can see what is trending on Tumblr. Browse through these posts to see what is popular. You will find that most of the popular posts are images, GIFs and quotes. If you want to drill down to see specific types of Tumblr posts that are trending, instead of what’s trending overall, click on options like ‘Text’, ‘Photos’, ‘Links’, ‘Audio’, ‘Video’, etc. Also, make sure to browse ‘Staff Picks’ and ‘Recommended For You’ sections to find a curated selection of trending posts. Examine these posts carefully. If you find anything your audience will enjoy, reblog it. Pay attention to what types of posts get the most notes. Use them as inspiration and create similar original posts. You will find that most popular posts on Tumblr evoke some form of emotion, humor being the most popular. Next, look at the recommended blogs under each section on the Explore page. Start from ‘Recommended For You’ and go all the way to ‘Asks’. Study these blogs and figure out what is so special about the content they share which is resulting in them begin recommended. You can share similar content in the future too. If you post great content that drives engagement, your blog will be recommended too. This can help you gain followers who will ‘Like’ and reblog your Tumblr posts. In the ‘Trending Searches’ section on the Tumblr Explore page you should be able to see what most people are searching for on Tumblr, at that moment. If you find a ‘Trending Search’ relevant to content you usually share, you must create (or find) a post on that topic and post it right away to take advantage of the trend. These are various ways to make use of the explore page to get more notes on Tumblr. Take time to study and learn what is working. This is a great resource for anyone getting started on Tumblr. Tags are similar to hashtags on most social networks. Tumblr gives you a separate section to add the tags. Posts with tags perform much better than those without. In order to drive maximum engagement, you must find and add relevant tags. You can easily research and find popular tags to get you more notes. One way to do this is by going back to the Explore page. Visit the Explore page and look for posts that are relevant to the one you plan to post. Then take a look at the tags added to them. You will see some a post’s tags on the lower half of the post on the Tumblr explore page. 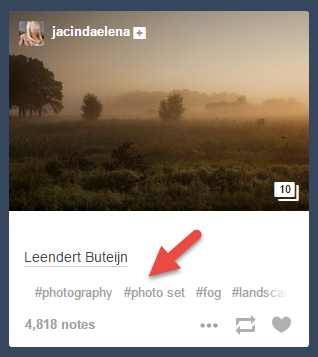 To see all the tags added to a post, click on the button represented by three dots found next to the reblog button. Now a menu will show up on the post. Click on ‘Permalink’ on this menu. The post will open in a new URL. On this page you can see all the tags that have been used. Find all the relevant popular posts and use this process to see what tags are being used. Add relevant tags to your post. You can also use the search words suggested in the trending or recommended searches section as tags if they are relevant. 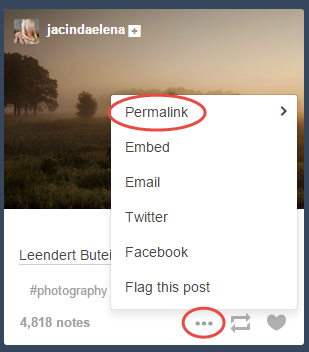 Pay attention while typing in the tags, Tumblr automatically suggests popular tags that are similar as you type. Add them to your posts too and see if they can get you positive results. Using the most popular tags on Tumblr can also help. 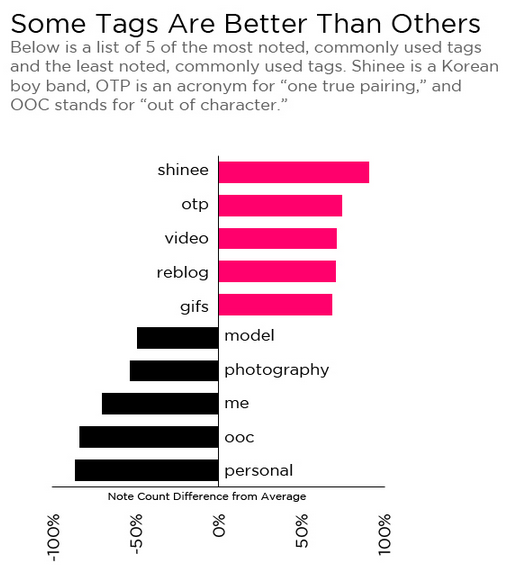 Dan Zarella conducted a study on 320,000 Tumblr posts and found that shinee, otp, video, reblog and gifs are tags that received the most notes and model, photograph, me, ooc and personal are the least noted tags. Try and use the more popular tags whenever you can and be cautious with the unpopular ones. Whole Foods does a great job at using tags on Tumblr. If you visit their Tumblr page, you will notice that all their posts have the most relevant tags. This Whole Foods post is a great example. They used the tags baking, powdered sugar, cake and sifting. 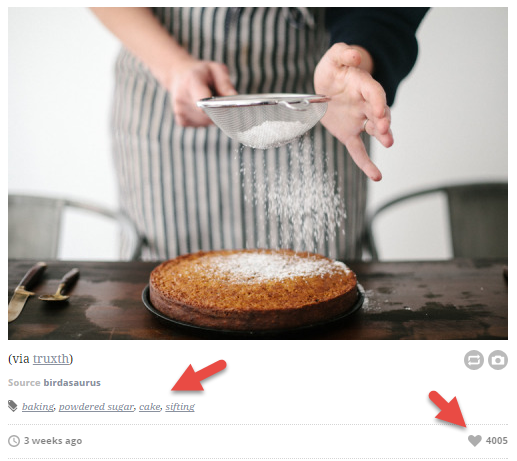 Each of these tags is perfect for this photo as it shows a person sifting sugar onto a freshly baked cake. The tags seemed to have played a key role in the post’s success; the post received over 4,000 notes. On any social network it is important for you to find the best time to post. You might have learned that it is usually best to post between 12 PM to 3 PM in the afternoon on social media like Facebook and Twitter. But forget that idea when sharing on Tumblr. Tumblr users are most active between 7 p.m. and 10 p.m (EST). Avoid posting between midnight and 4 p.m. EST as activity is lowest during these times. 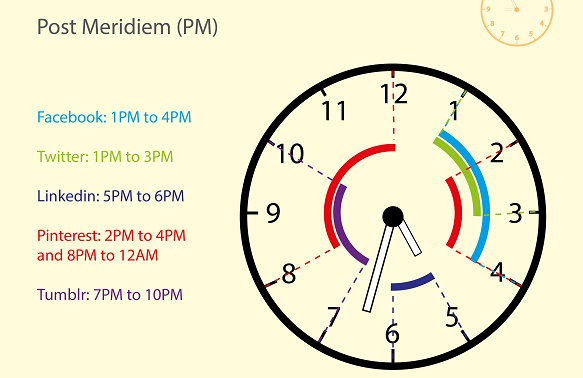 You can post after 4 p.m., but make sure you schedule your most important posts between 7 p.m. and 10 p.m. The best days to post on Tumblr are Monday, Tuesday, Friday and Sunday. You might have already noticed (while browsing through the Explore page) that images are extremely popular on Tumblr. As I mentioned at the start, images make up almost 80 percent of all posts. Tumblr users know that people like interacting most with images. 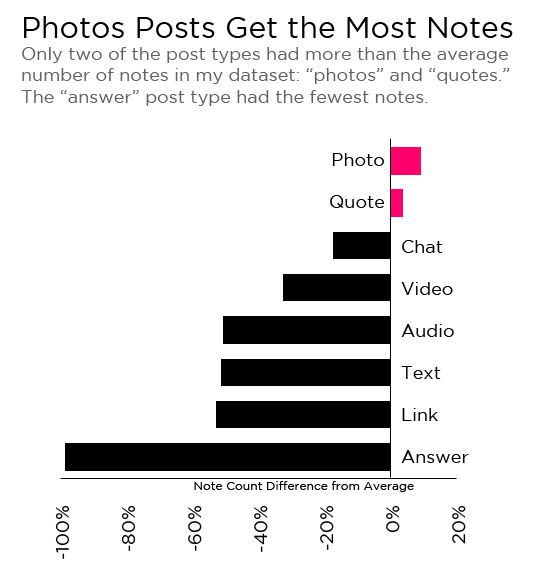 Even the study by Dan Zarrela found that photos get the most notes on Tumblr. Therefore if you want to boost your Tumblr presence, you must regularly post images. These could be photos, illustrations, comics, memes and even gifs. Just make sure they are relevant to the Tumblr brand you are building. These should be a mix of images created by others and those created by you. Sharing original images is preferred as it will help you standout. You can hire a designer or create these images by yourself. Online tools like Canva and Picmonkey enable you to make simple graphics on your own. In fact, since Canva is integrated into Viraltag, you can create images and directly schedule them onto Tumblr using Viraltag. Coca Cola posts some of the best images on Tumblr. 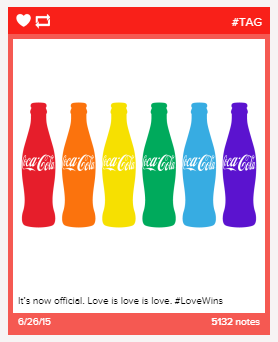 For example on the 26th of June 2015, they published an image with a row of bottles depicting the colours of a rainbow to show their support for the legalization of gay marriage all across America. The image received more than 5,000 notes. Take that as some inspiration to create original and creative images that stand out and make a lasting impression on your audience. Get into your audience’s minds, think the way they do, and brainstorm topics they will be interested in. The results will be well worth your time and effort. These are the best ways to get more notes on Tumblr. So do a lot of research, create original images, add tags and schedule your posts at the best times. Also regularly check the metrics section to see what types of posts are helping you achieve positive results on Tumblr. Learn and iterate and see success. What steps do you take to get more notes on Tumblr? Did I forget to add anything important? Please leave your comments below.